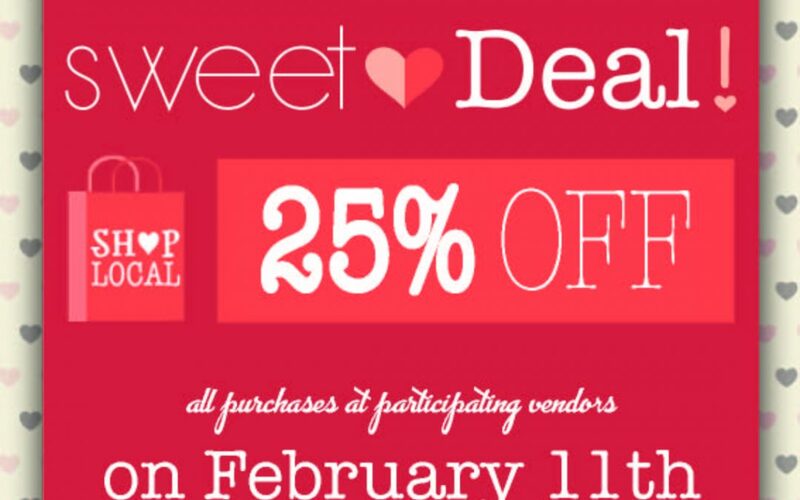 Come to the market on Saturday, February 11 and take advantage of a Sweet Deal – get 25% off all purchases from participating artisan and prepared foods vendors, including: Adam’s Honey, Annanda Chaga, Barrie Olive Oil, Beach Baby Bath & Body, Dolcella Gelato, Egon’s Chocolates, Elegance by the Duo, Georgian Chocolate Co., Grandpa’s Hungarian Sausages, Homestead Artisan Bakery, Jacobi’s Crafts, Joan LeBoeuf, Jun’s Roll & Sushi, Lotus Natural Living, Mays Food Service, Mettrum Originals, Pleasures & Pastimes, SoupHerb Soups, Terry’s Unique Hot Sauce, Turnview Farm, and Your Ultimate Meals. Look for the big red heart on vendor tables to get the discount and enjoy samples of Heritage Estate Winery & Cidery’s cranberry-apple sangria while you shop. You can also catch a live performance by Em Patrick. Em is a singer/songwriter who believes in the power of storytelling and can enrapture an audience with her full-voice and sweet, soulful tone. She is a self-taught, locally grown artist who is inspired by the voices of an era gone by. She’s also part of the team at Homestead Artisan Bakery! Join us at the market every Saturday, all year long. The Barrie Farmers’ Market keeps bringing fresh local goodness to the City Hall rotunda all the way through April. Stop by between 8 a.m. and 12 p.m. and meet your local farmers, producers, chefs, bakers, and artisans, then enjoy some skating on the Circle at the Centre. See you Saturday!